Buy your way to fame and fortune in Renaissance Florence. Welcome to Florence when it was the heart of trading throughout the Mediterranean. Each player is a buyer for one of the rich families of Florence, Italy. They must compete to outbid the other buyers to amass the most valuable collection of furs, grain, spices, dyes and cloth. Medici is played over 3 rounds where each player will get to select 1, 2, or 3 cards representing one of the 5 goods for auction. Each player gets 1 bid with the selecting player bidding last. Once purchased, each card will be placed in 1 of the 5 spots available on their ship. Players cannot purchase more than their ship can hold. Auctions continue to be held until only one player has room on their ship. They get to fill their ship with random draws from a draw pile. Scoring takes place after all ships are filled. For each type of good, a player gains 30 money for having the most value on their ship of that good. Goods cards are valued from 0 to 5. Second place for each good earns 20 money, and third place earns 10 money. Players move a scoring marker on a track each time they purchase a card of a good. There is a track for each type of good. At the end of the round, the player furthest up the track gains 10 money. Second place gains 5 money. Additionally, there are bonuses for moving to the top of each track. Counters on these tracks are not reset between rounds. After 3 rounds the player with the most money wins. Even though the game mechanics are straight forward there will be some interesting decisions to be made. How many cards do I offer each turn for auction? Should I go for the high value cards, or should I concentrate on getting more cards of 1 type to move up that track and grab some serious bonuses? And yes, I have to manage my money to be able to bid on choice lots when they become available. 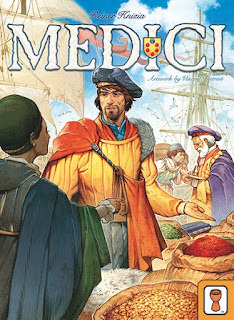 We are glad Grail Games has decided to reprint this Reiner Knizia classic from 1995.